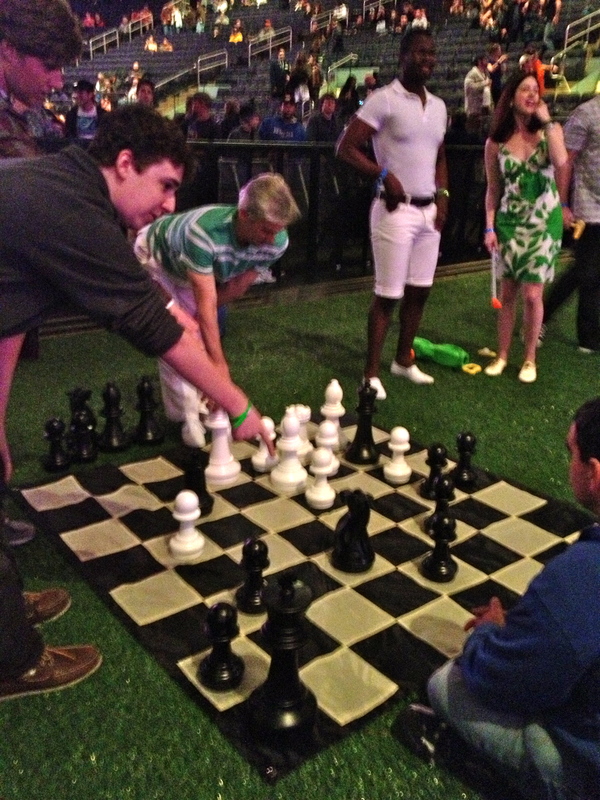 Word spread of a photo leaked on the morning of 12/31 of Madison Square Garden’s floor covered in fake grass. The rumors had some fans (including much of my crew) going on a social media blackout, worried they’d catch wind of what Phish had in store on the final day of 2012. As @PeteLikesPhish said, “Is Nothing Sacred Anymore!? !” I accidentally saw the leaked photo via a friend who texted me with no spoiler warning attached (shame!). My mind was racing trying to guess what it could all mean. “Lawn Boy?” A Gamehenge narration? No, they had already played “AC/DC Bag” earlier in the run. Did the poster offer any clues… Somewhat, but the yellow brick road threw me off completely. The crew members staged on the floor were welcoming us to “Their Garden Party.” Folks were playing badminton in the GA West section with an actual net! Others were busy playing chess and croquet. Where in the world were we? About a half hour before showtime, three women walked to the back of the stage and began stripping down to their bathing suits, sunbathing under the lights to the delight of the crowd. With just a few minutes before showtime I told my crew “Phish has already topped last year’s gag and they haven’t even played a note of music yet.” It was met with a few laughs, but I was serious. Granted it wouldn’t be hard to top last year’s phone-it-in affair, but with just a few quick strokes of creativity, Phish set the right mood in the “World’s Most Famous Arena” at 7:30pm. The final show of 2012 already had a theme attached to it. It was already special, already memorable. Phish just had to deliver the musical surprises to attach to the visual memory. We now know the creative designer for the Runaway Golf Cart Gag and the Garden Party. It was the creation of @DavidGalloDes who I unknowingly took a photo of at the mini-golf course. He’s pictured to the far left with the beard. @PeteLikesPhish and I even spoke with David and one of his assistants trying to guess the “Backwards Down the Number Line” hole, which we were completely stumped on. David has uploaded some amazing photos of rehearsals and the Fishman logo Golf Cart. Kudos to everyone involved in making The Garden Party and Runaway Golf Cart Marathon a reality! Phish kept the night special from the first note, opening with a cover of Ricky Nelson’s “Garden Party.” The song was not only fitting for the garden-theme, and the fact that it was written about a gig at MSG, but it’s lyrics were poignant for the State of Phish we currently find ourselves in. These three lines stood out to me as a defining statement on our scene in 2012-2013. Once the band segued into “Sand” then followed with “The Wedge” things were still kickin’ as a song-themed set began to emerge. Each song after Reprise referenced golf, keeping everyone on their toes and into the set even if they hadn’t caught on to the golf theme yet. Phish as I said, delivered a NYE show on 12/31/12 that can stand at the front of the pack with the year’s best shows. It carried an entire theme — The Garden Party, had a second set with masterful song selection and improv (Birds of a Feather, Ghost > Piper > Light > Also Sprach Zarathustra > The Horse > Silent in the Morning, You Enjoy Myself) and a gag that not only made sense within the world of Phish but carried till the end of the show. Even the post-show exit music was Kenny Loggin’s “I’m Alright” made famous by Caddyshack). Besides a 20-minute jam (which Phish gave us on the first night of the run, so shut up)…what more could you really ask for? Phish are in their mid-40’s and delivering more surprises and music that will live in the archives than most bands are doing at the beginning of their careers! As Page referenced in between “Driver” and “Iron Man”, Phish’s 30th Year is most definitely something to look forward to! Waves was played at MSG for the first time since it debuted there on 12/31/02. This show was the weakest of the run offering little exploration and was more song-based than the other three nights. “Suzy Greenberg” included some great work from Page and “46 Days” had some extra energy to close the Second set. The three-song encore can’t be overlooked either. This Divided Sky has a little extra “oomph” to it (especially the last 4 minutes). An early 90’s feel that put me on alert that this show was going to be special from the get-go. First Full Performance of Iron Man by Black Sabbath w/ Page on lead vocals. This entire NYE show is one big highlight really. 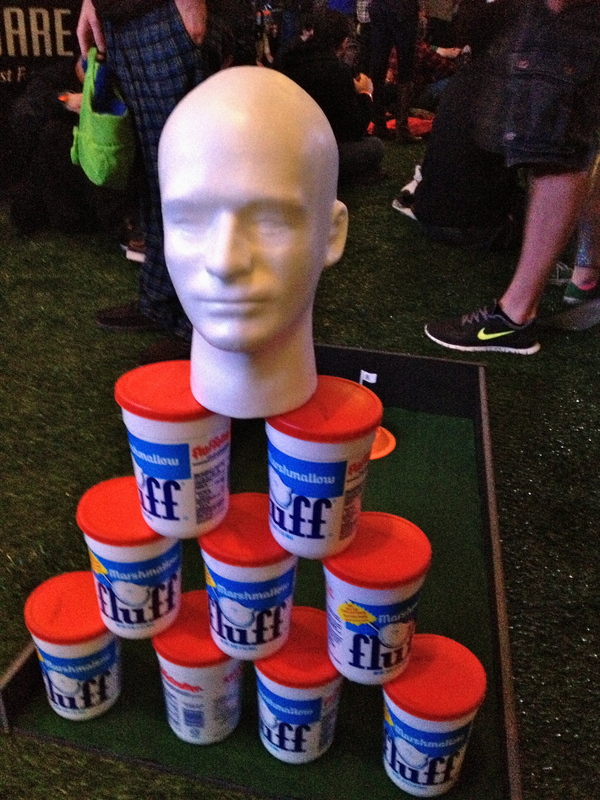 It had a theme (Golf Garden Party! ), debut covers (Fly Like An Eagle, Iron Man), Phish originals that pack a serious punch (Ghost>Piper>Light) and a gag that started the moment folks entered the arena. 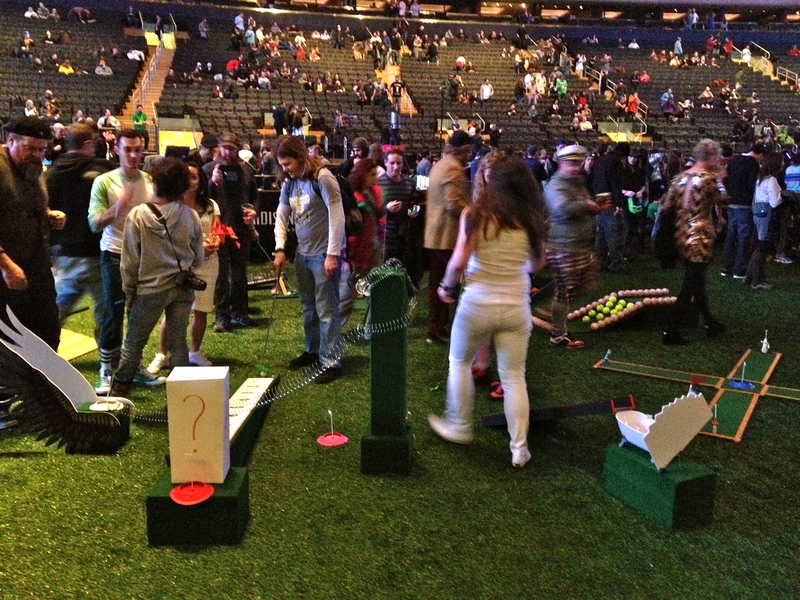 How many people can say they played mini-golf inside Madison Square Garden? Phish’s effort in NYC last year has officially been forgiven. Let’s hope the band carries the momentum into the new year. Rumors have already started that there could be a few more shows on the calendar than in recent years, but I’m not holding my breath. A new album is likely on the 2013 horizon according to Page and Trey, one that should offer more improv-laden songs than 2009’s Joy. Here’s my Summer Tour Wishlist for Mr. Coran Capshaw — A return to Harvey’s in Tahoe, THREE NIGHTS @ The Gorge, The Hollywood Bowl (so @ChrisCK5 can light up the shell again) and a three-night 30th Anniversary run at the Hampton Coliseum. A venue the band hasn’t played since their return in March 2009! My fingers and toes are crossed! Throw in a Halloween show and we should be very excited to slip into the future with Phish.